Brackenbury, J. 1991. Wing kinematics during natural leaping in the mantids Mantis religiosa and Iris oratoria. Journal of Zoology 223:341-356, Part 2. Gemeno, C., J. Claramunt, and J. Dasca. 2005. Nocturnal calling behavior in mantids. Journal of Insect Behavior 18(3):389-403. Lawrence, S. E. 1992. 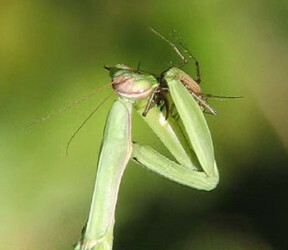 Sexual cannibalism in the praying mantid, Mantis religiosa - a field-study. Animal Behaviour 43(4):569-583. Prokop, P. and R. Vaclav. 2005. 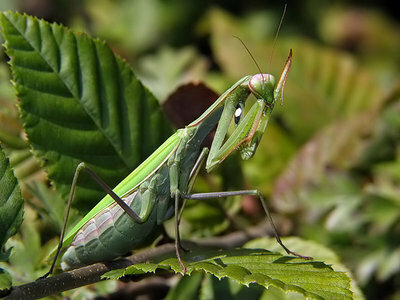 Males respond to the risk of sperm competition in the sexually cannibalistic praying mantis, Mantis religiosa. Ethology 111(9): 836-848. Reitze, M. and W. Nentwig. 1991. Comparative investigations into the feeding ecology of 6 Mantodea species. Oecologia 86(4):568-574. Yager, D. D. and R. R. Hoy. 1987. The midline metathoracic ear of the praying mantis, Mantis religiosa. Cell And Tissue Research 250(3):531-541. Yager, D. D. and R. R. Hoy. 1989. Audition in the praying mantis, Mantis religiosa L - Identification of an interneuron mediating ultrasonic hearing. Journal of Comparative Physiology A-Sensory Neural and Behavioral Physiology 165(4):471-493.